This is a digital downloadable item. You will download a copy of this digital product directly to you computer. No items will be shipped to you. All sales are final. No refunds. Should you have any questions please email customerservice@nowisyourmoment.com or call 205-362-7133. MP3 Player or to a blank CD or e-reading device. you may CLICK HERE to download a free copy. Who Else Wants To Learn The Secrets of Leadership & Entrepreneurship from 2 of The World’s Leading Success Coaches? Discover the hidden keys of success and prosperity in a powerful 6 week home-study course designed to take YOU to the next level of success! This training school is designed for YOU! Have you have ever wondered or thought to yourself that some people just seemed to "be blessed” or "always succeed”? Does success always seem to be "just around the corner” yet so far out of reach? If so, this is your wake up call my friend! I invite you to look closely pay attention to this letter and discover all that is possible in your life when you invest in this powerful Schoolof Leadershipand Entrepreneurship! During the first week you will discover how to Focus On Your Call and the defining difference between Involvement and Commitment in your walk of business! You will hear Lopez and Sutton bring you decades of experience! During week two you will still be processing the previous week’s revelations as you dig into an eye-opening book by Jeremy, "You Were Born To Be An Entrepreneur!”I invite you to take week two and dig into this book with expectation as you discover being an entrepreneur is literally your calling! This book has been called a transformational shift in awareness for so many people as Jeremy unpacks the revelations through this course’s first book. Finding success as an entrepreneur can be like finding a needle in a haystack. You know it’s there but the more you search the more confused you become! It’s tough because you truly desire to change things in your life. Perhaps you want a second income to pay off debts and enjoy a real vacation for a change! Maybe you want wish your boss a good life and free yourself from the rat race. Maybe you are already a leader, an entrepreneur, and you simply want to go to the next level. Listen really close my friend - YOU, YES YOU, CAN! Let’s get back to what you are going to discover as you invest in this powerful school… We are now in week three and your mind is running with ideas, with determination, and with a new level of certainty. Now, let’s place some action behind your determination and new revelation. In week three you will dig into the process of Devising A Business Plan For Your LIFE! This is not your typical heard-it-all-before "write a business plan” chat. This week will be the escape from mediocrity in business and yes, life planning! This week will also pour into your life the Value On Building a Business and the often not-discussed Characteristics of a Leader! This school, and your entire life is more than making lots of money, it’s also the values and leadership that will inspire you, and inspire others! Week four is really important as you implement these strategies into your life… You will learn about Feedback on Life, the Leaders Structure, and the secrets of Incorporating Family Into Your Endeavors. This will be a week of studying and a week of working on "heart matters”. It is amazing what can be accomplished when you align your heart with your head – the soul and the mind want to work together, and they can produce greatness! As you go into week five of this school you will be doing some more reading and discovering how you can accomplish MUCH MORE in far less time… You will go through Wayne Sutton’s book that he uses for Success Coaching all over the world, and learn how to have Time For YOU! Effective time management that works! You may be tempted at this point to read this book first, but I urge you to stay on course, week five will be here before you know it! And finally, after 5 weeks of redefining your goals, your plans, and applying these powerful leadership principles in your life – you still get to dig into one more week of insight! Week six is the activation week, where you learn from Jeremy about the NOWBiblical Leader, and Waynereleases his teaching The ABC’s of Wealth Accumulation! Yep, you are gonna dig deeper here in the last week! This course was designed with YOU in mind. After coaching and counseling literally thousands of people, we have discovered that entrepreneurs and leaders are unique, determined, and literally born to succeed! 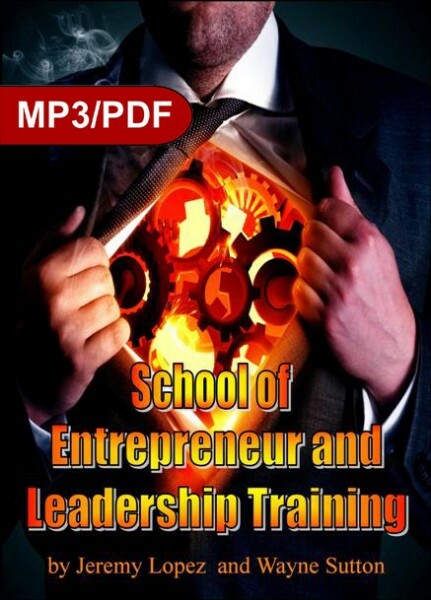 Here are your keys in a simple easy to follow Schoolof Leadershipand Entrepreneurship! The entire school is available for Instant Download – and priced at a fraction of its true value! Pick up your copy today ON SALEfor only $69.99– this almost 50% off the retail price of $130.00 – and you get all 10 audio teachings and both e-books! Jeremy Lopez and Wayne Sutton will bring you the golden nuggets and tools you need to move ahead, get to the next level, and finally prosper!